The Model 3400KL digital diaper, lap sponge, and organ scale uses highly sophisticated microprocessor technology. Each precision scale is designed to provide accurate, reliable and repeatable weight measurements. In addition, each scale is designed to provide the user with features that make the weighing process simple, fast, and convenient. 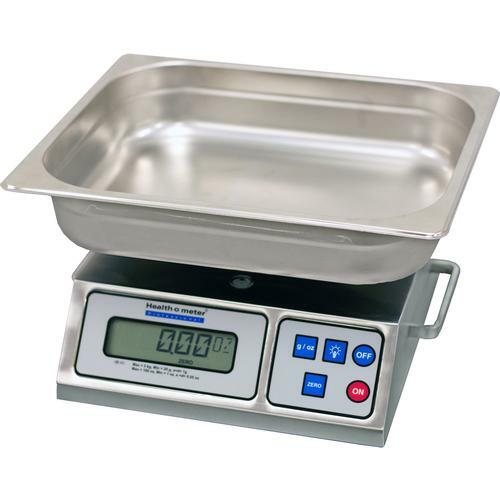 Stainless Steel Base and Weighing Surface: The stainless steel design is easy to clean and ideal for sterile environments. Rechargeable Battery Power Source: Scale is powered by a 6V rechargeable battery with AC adapter/battery charger included with the scale. High Resolution Measurements: Scale provides highly precise and accurate results with refined 0.1 oz / 1 g resolution. Convenient Weighing Pan: The deep and wide weighing pan effectively retains fluids and can be removed for sterilization. Backlight Display: Easy to read from any angle and light condition.